Download the file, below, and print your own sheet of 63. 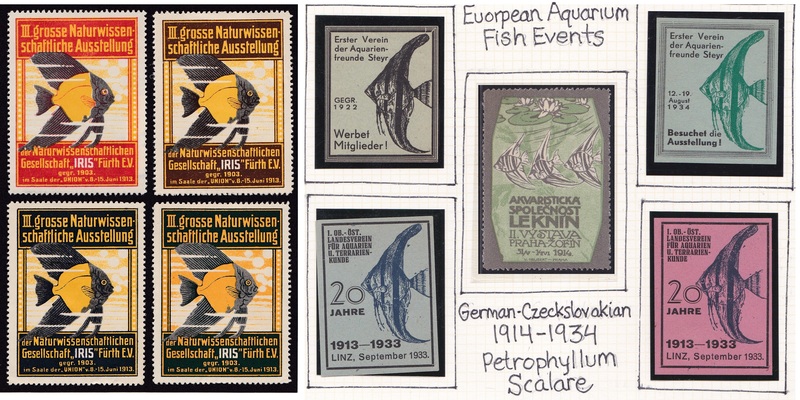 I love these early European tropical fish events. At one time I had 7 fish tanks and have bred quite a few different species, including Pterophyllum scalare, the fresh water angelfish pictured here. Occasionally, I wish I had the space for a tank, but instantly recall that collecting seals is a lot less work. 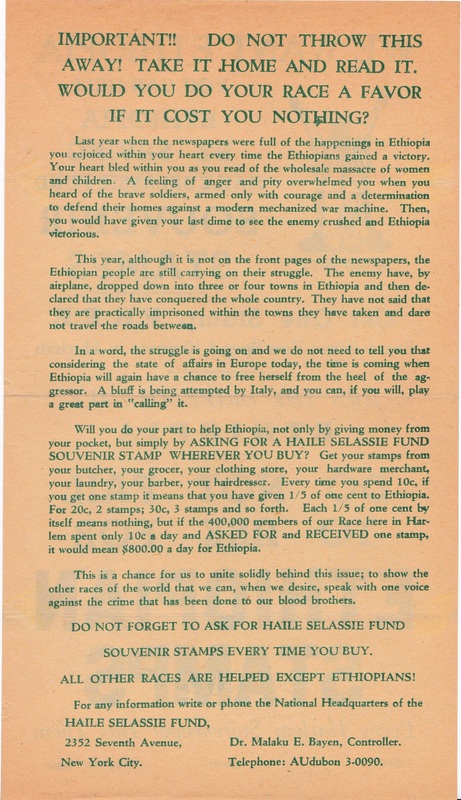 Going thru a fine reference collection of Ethnic Seals listed in Mosbaugh's All Fund Catalog; came across a fascinating Haile Selassie Ethiopian fundraising poster. 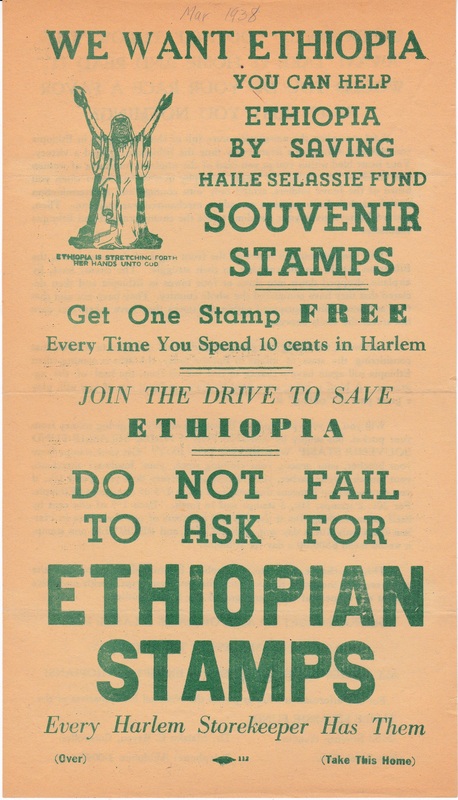 This US Fund was sold in Harlem, NY. 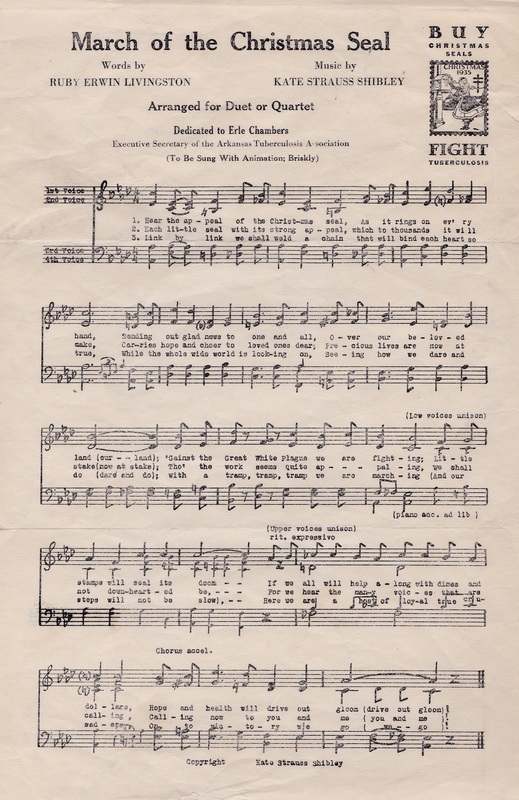 The 1935 "March of the Christmas Seal" Song, written by Ruby Erwin Livingston and Kate Strauss Shibley, was dedicated to Erle Chambers, Executive Secretary of the Arkansas TB Association. 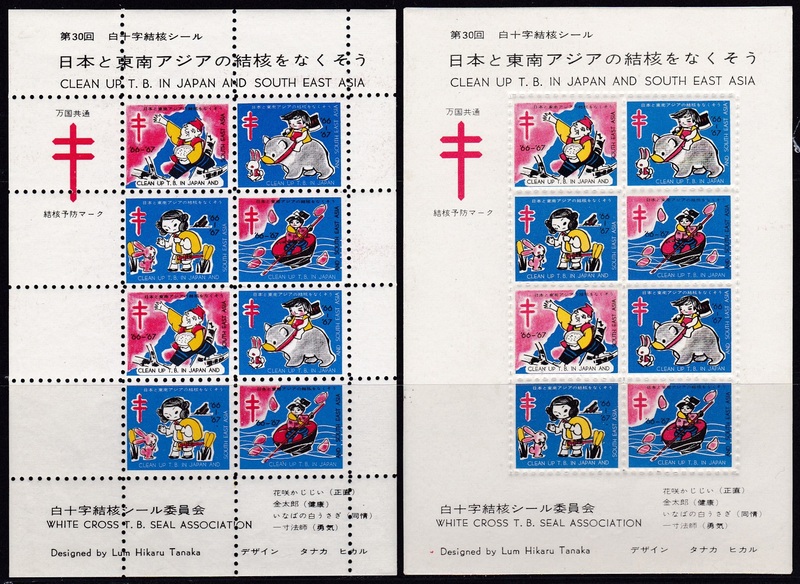 In 1966 Japanese White Cross Association (Greens #48) issued four different fairy tale TB seals in a sheet of 10, perforated as well as roulette. The Japanese fairy tale descriptions are the work of CS&CSS member, Mr. Brzezinski. 1) Hanasaka Jiji - The old man who makes trees blossom out of season. He is the subject of a popular Japanese fairy tale. Once upon a time, there was an old couple who had a dog called Shiro. They also had very unpleasant neighbors. One day, Shiro started to bark at a certain spot in the garden for such a long time that the old man dug up the earth at the place and to his great surprise unearthed a large number of coins. The neighbors who had watched the scene through the fence, at once thought the dog possessed some magic power, and after trying to entice it into their own garden, succeeded only by force, whereupon they commanded the dog to find some treasure for them. Shiro again barked over a certain spot in their garden, but upon digging they only found a pile of filth and offal; so they killed the dog there and then, burying it underneath pine trees. 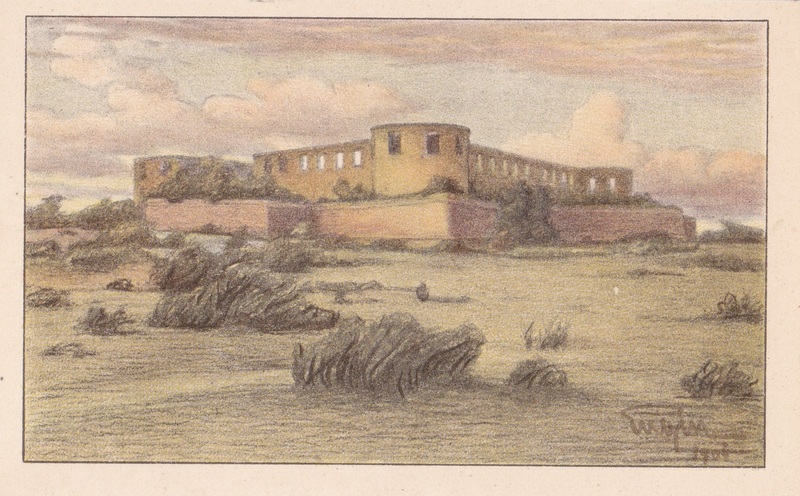 The old man grieved over the loss of his pet and offered sacrifice upon the spot, and during the night he was visited by the ghost of the dog who commanded him to cut down the pine tree and make a rice mortar of the trunk, which would possess the quality of being able to pound each grain of rice into a piece of gold. The neighbors envied the old man and stole the mortar only to find that the rice turned to filth, and in their rage they broke and burnt it. The ghost of the dog returned once more to the old man and told him to gather the ashes of the mortar and scatter them over the dead trees, as the ashes touched them they began to sprout and became covered with blossoms. He traveled over the country and his fame spread. The Daimyo of a neighboring province loaded him with presents. One of his neighbors tried to imitate him with ordinary ashes, but upon being called to the mansion of a prince he not only failed to make trees blossom, but the ashes blew into the prince's eyes with the result that he was given a sound beating. But the old man took compassion upon him and gave him some gold, after which the neighbors repented of their ways. 2) Kintaro, a little chubby boy with sparkling eyes and rosy round cheeks, was the best friend of the animals in the woods. 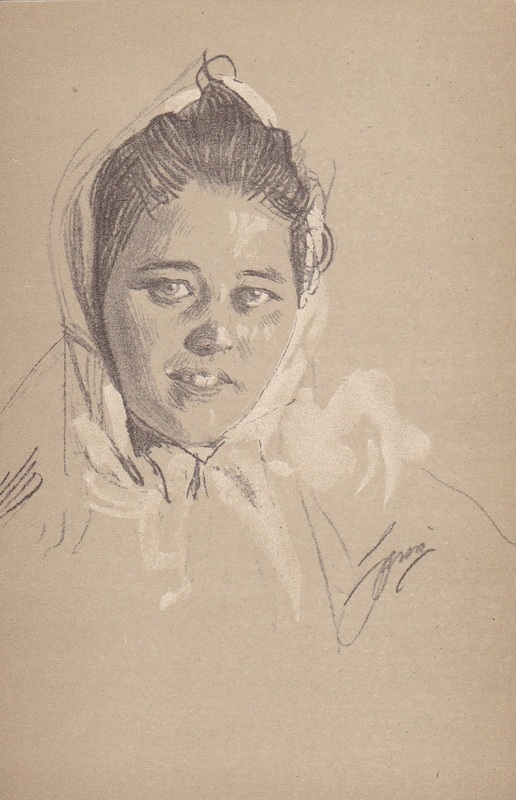 He lived a secluded but natural and happy free life with his mother in the Ashigara Mountains. The strong boy Kintaro loved the black bear, and was gentle and friendly to the timid rabbit, the nimble monkey, the swift footed deer, and many other animals. The boy and the bear played Sumo, or Japanese wrestling almost every day and the picture of Kintaro overthrowing a bear has become quite popular among Japanese boys. One day Kintaro and his animal friends wandered far into the woods. When they came to a deep canyon with no bridge, Kintaro pushed a pine tree with all his might, until it fell over the chasm, and they succeeded in crossing the valley. A traveler looking at the wonderful work of the little boy, persuaded him to go to the capital and serve the great Lord Raiko. Kintaro went up to Kyoto and the traveler who was one of Raiko's followers, and in later days he became one of Japan's well known heroes - Kintoki Sakata, because of his bravery and goodness. 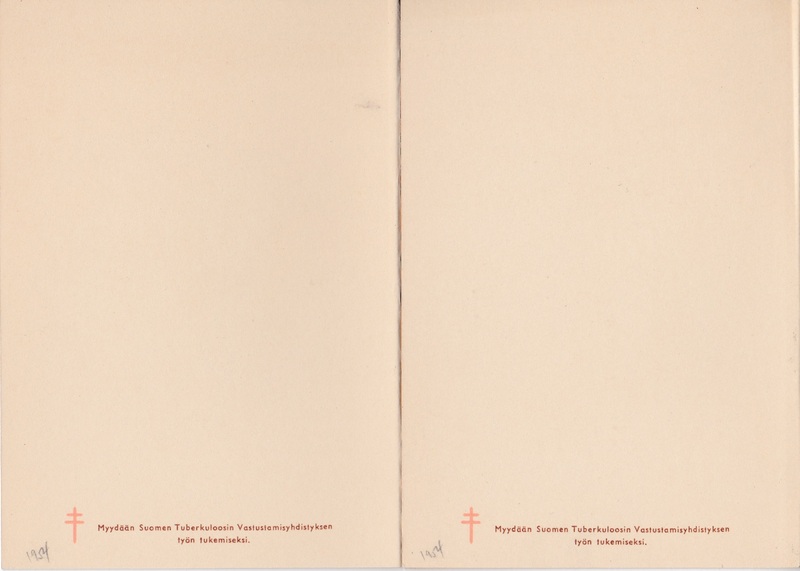 3) Ookuninushi-No-Mikoto - Once there was a white rabbit who wanted to cross the sea. Across the waves he could see a beautiful island and he wanted very badly to go there. But he could not swim and there were no boats. Then he had an idea. He called to a shark in the sea, and said: "Oh, Mr. Shark, which one of us has the most friends, you or I?" "I'm sure I have the most friends." said the shark. "Well, let’s count them to make sure." said the rabbit. "Why don't you have your friends line up in the sea between here and that island over there, then I can count them". So the sharks lined up in the sea, and the rabbit went hopping from the back of one shark to the next, counting, "one, two, three, four..." Finally he reached the island and turned to the sharks, and said "Ha, Ha! You dumb sharks. I sure fooled you. I got you to make a bridge for me without you even knowing it." The sharks became very angry. One of them reached up and snatched a piece of the rabbit's fur. "Oh it hurts!" cried the rabbit, and began weeping. Just then the king of the island came by. He asked the rabbit what was the matter, and when he heard the rabbit's story, he said, "You must never fool others and tell lies again. If you promise to be good, I'll tell you how you can get your fur back." So the king gathered some bulrushes and made a nest with them. "Now you sleep here in the nest of bulrushes all night," said the king, "and your fur will grow back." The rabbit did as he was told. Next morning he went to the king, and said, "Thank you, thank you very much, my fur grew back and I'm well again, Thank you, thank you." Then the rabbit went hopping off along the sea shore, dancing and singing. He never tried to fool anyone ever again. 4) Issun Boshi - There was a good and honest couple in a village. Both the husband and the wife prayed to God that they might have a baby of their own - even a tiny little fellow as small as an inch. To their great delight, a baby was born, but he never grew taller than an inch, so that when they named him Issun Boshi or Issumboshi, which means One Inch Boy. One day Issumboshi wanted to go on a trip. His father gave him a glistening needle to use as a sword; his mother found him a lacquer bowl and chop stick as a boat and oar. Taking leave he rowed for days up the Yodo River, coming to the Capital. There a beautiful princess happened to pass in a lacquered palanquin, which stopped in front of Issumboshi for just a while. Jumping in without being noticed, he went to the mansion of the princess's father. Surprised at the voice of a person whom they could not recognize, they looked here and there and at last they perceived the small figure. The princess became very fond of him. One day the two went out a long way, when suddenly appeared a hideous looking ogre, rushed toward the princess ready to take her away. Issumboshi drew his needle sword, shouting in a large loud voice. The ogre picked him up and swallowed him down, but Issumboshi pricked and pricked his stomach until the ogre rolled on the ground in pain, Choking, he coughed up Issumboshi. After the ogre ran away, a magic mallet was found to be left behind. When the princess waved it up and down, Issumboshi shot up taller and taller to become a grown man. The princess's father granted his daughter's hand in marriage to the youth, and they both lived happily ever after. For the size of the country, Belgium has been one of the most prolific issuers of TB Seals. 1947 Belgium (Green's #19) is unlike most TB seals, because they are (intaglio) engraved. 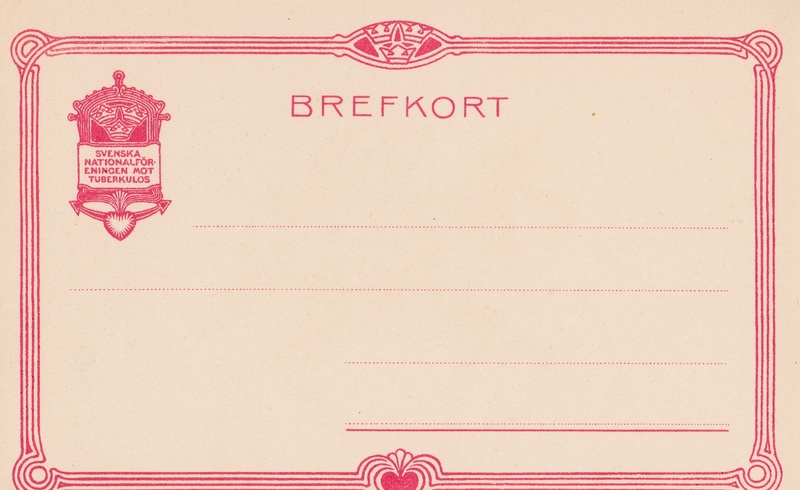 This costly method of printing is usually reserved for paper money and some postage stamps. 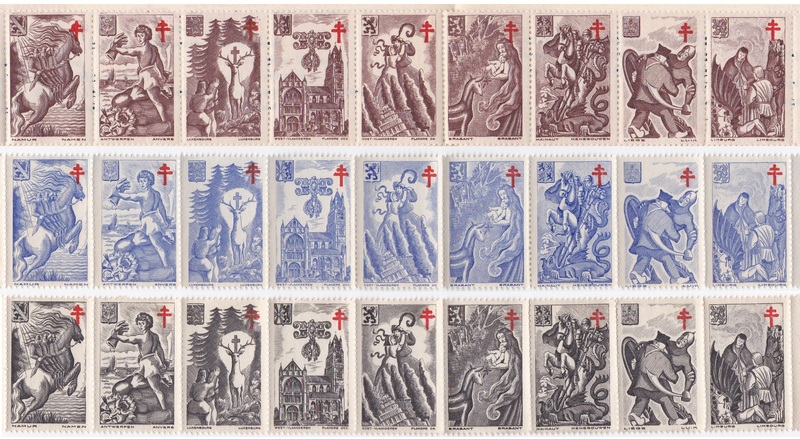 This set of 9 different depict local legends with coats of arms, and were issued in three different colors. The following was written by an unknown seal collector April 10th 1947. A page was missing, so if anyone has information on the 4 missing legends, please contact your webmaster, john@christmasseals.net. 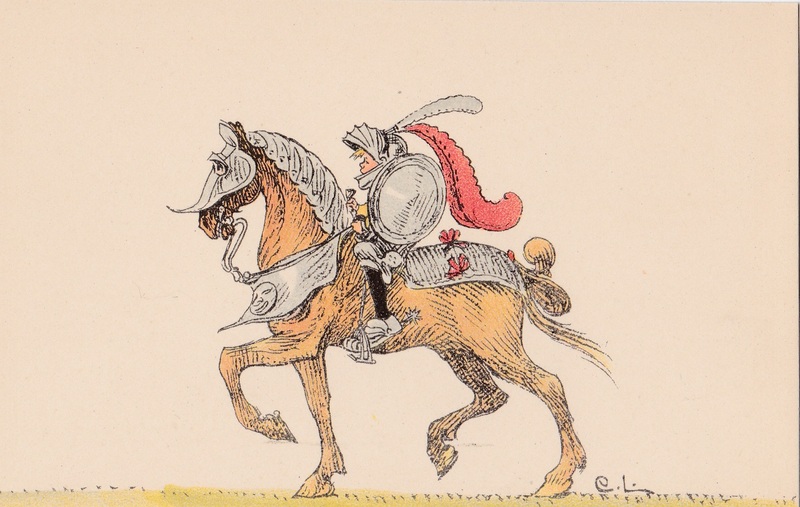 1) The Legend of Horse Bayard (Namur) - The legend of the Horse Bayard and the four sons of Aymon has spread over the whole of Western Europe. It is particularly popular in the district of Namur. Fleeing before Charlemagne's wrath, four knights closely pressed by their pursuers reach the bank of the Meuse. With a mighty jump, Bayard clears the enormous ravine, landing on a rock which still bears its name today and on which the marks of the hoofs are still visible. 2) The Legend of Brabo (Antwerp) - In the time of Julius Caesar, a giant terrorized the bargemen who sailed up the Scheldt. Seven men of the district practiced archery and felled the giant by piercing his eyes and throat. The Roman Governor, Salvius Brabo, cut off the giant's head and threw it into the river in the presence of the people who had assembled there. 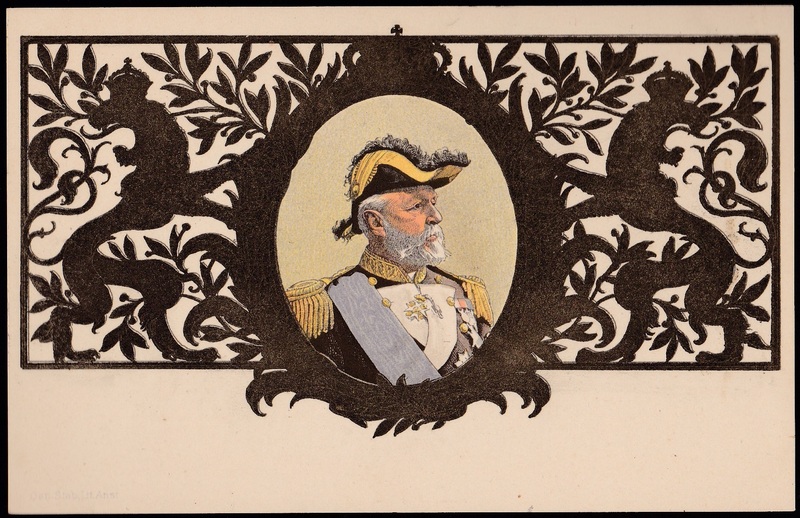 The seven liberators became the heads of the Patrician families of Antwerp. 3) The Legend of Saint Bubert (Luxemburg) - Of noble birth, Hubert of Aquitaine indulged without restraint in the joys of a worldly life. (He was a "Gay Dog.") One day whilst hunting in the Forest of Ardennes, a wonderful big stag, with a crucifix between its antlers stopped suddenly in front of him. 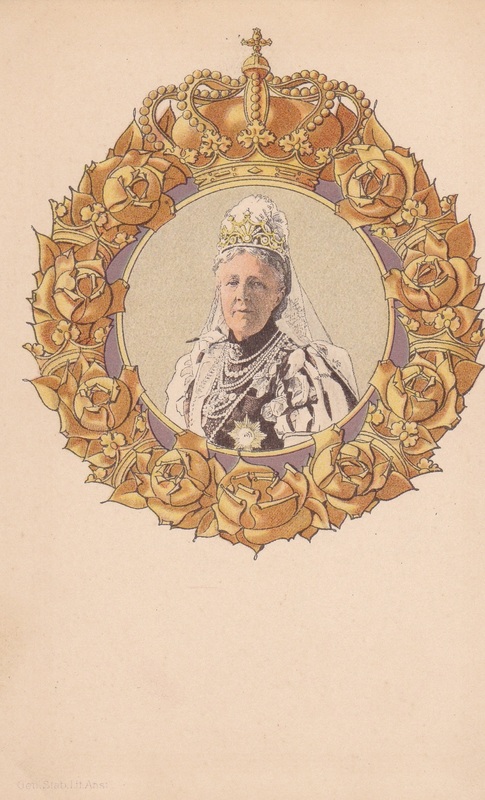 This apparition had a decisive influence on the future of the noble earl. 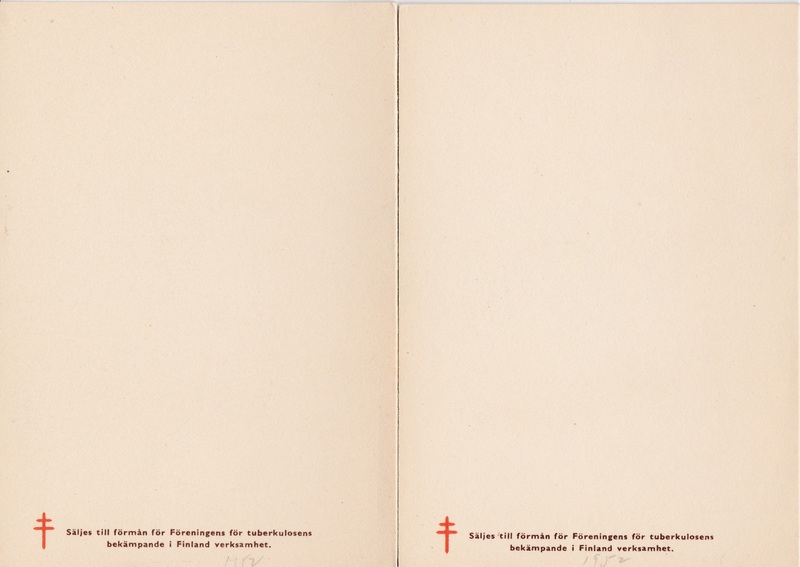 Successor to Saint Lambert as Prince Bishop of Liege, his souvenir has remained most popular in this region. 8) The Legend of Tchantches (Province of Liege) - Tchantches (Walloon for Francis) is a celebrated character in Liege. According to local tradition, he was born in the Quarter of Outre Meuse, between two cobble stones in 760. 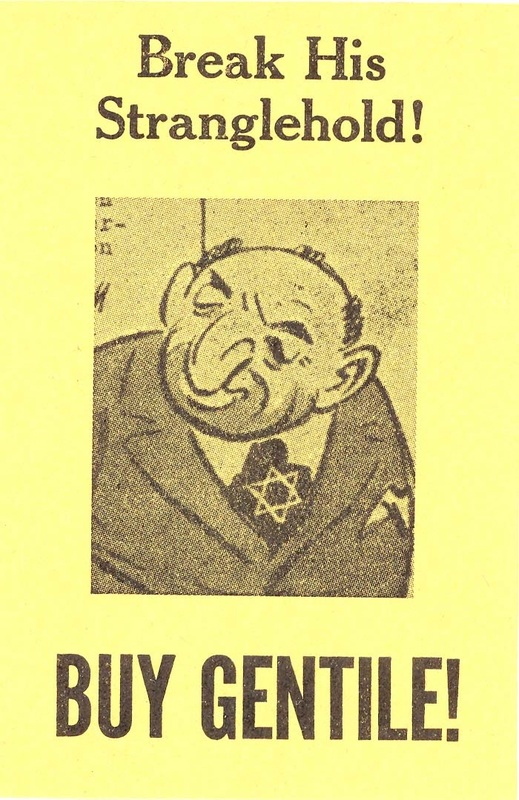 Through an accident when being baptized, he was afflicted with an enormous nasal appendage. The story of Tchantches is a long succession of joyful anecdotes showing the degree of intimacy between him and Charlemagne, whom he never left, day or night. One of his most remarkable achievements was his attitude at the Battle of Roncevaux where he shattered to pieces at least three thousand Saracens, remaining invulnerable himself, thanks to his nose. 9) The Legend of the Knight of the Cards (Limburg) - Popular belief has created a legend around the presence, in the Cemetery of Heppeneert (Limburg) of a tombstone bearing coats of arms representing three hearts and five diamonds, the legend seems to be the local version of a general legend known in several continental countries. A knight has lost all of his fortune gambling. To make up, he calls on an evil spirit and sells him his soul. On the fateful date the knight is happily saved by a good spirit to which the Limburg version has given the features of Saint Gertrude. 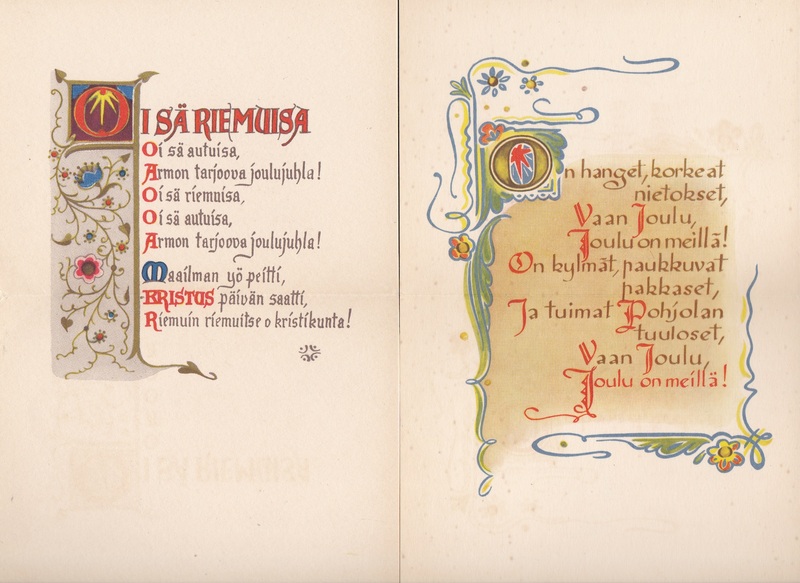 public auction, first day ceremonies, 50 societies and more! More information to follow. Every other year, The Christmas Seal & Charity Stamp Society gathers for a meeting and hosts a society booth where our hobby and literature are put on display. 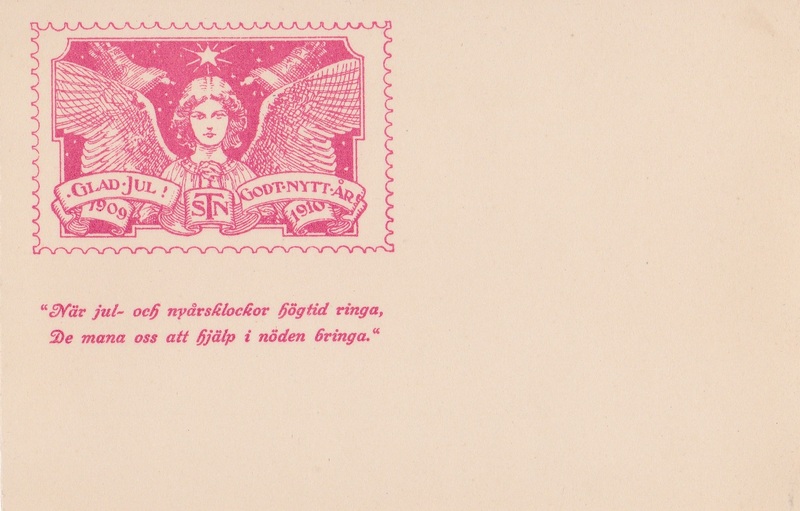 If you are interested in exhibiting your Christmas Seal collection in competition, contact the APS http://www.stamps.org/Home. 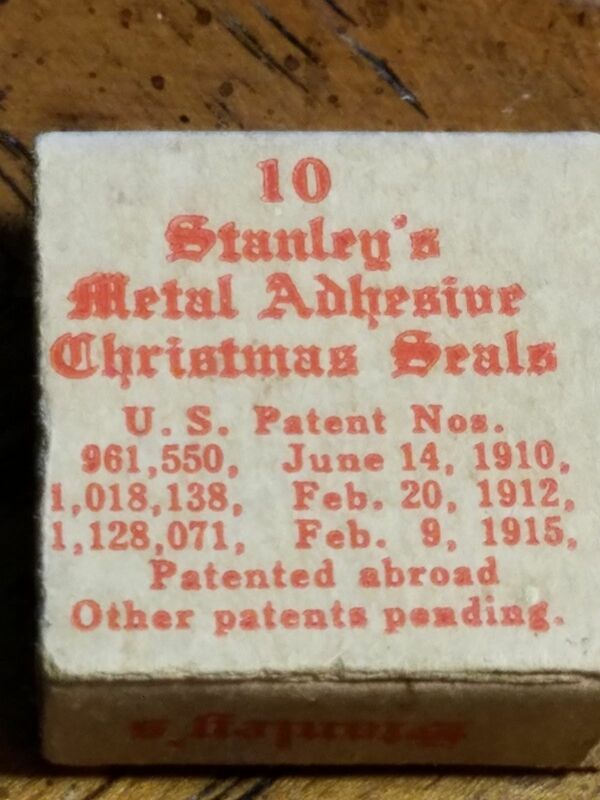 Early Generic Use of the Term, "Christmas Seals"
A U.S. patent was granted for "Christmas Seals" in 1910. 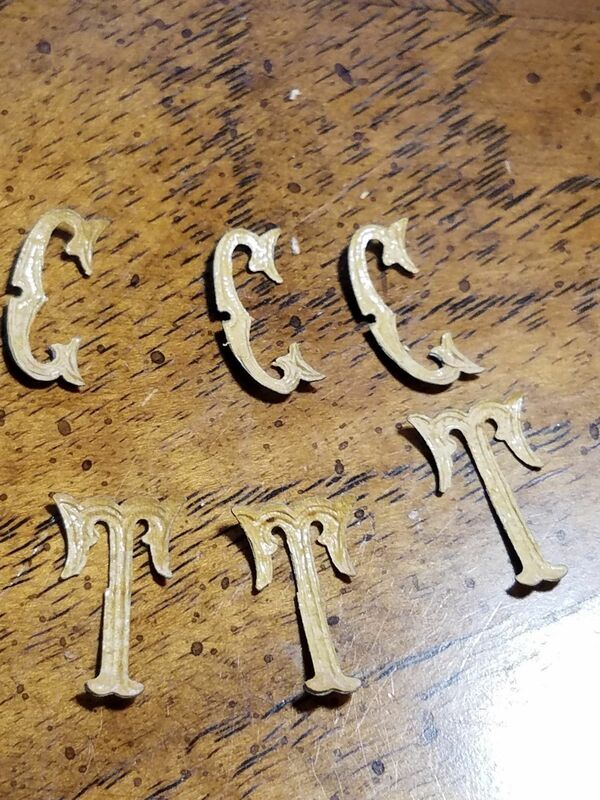 These were commercial letter shaped stickers for sealing envelopes. 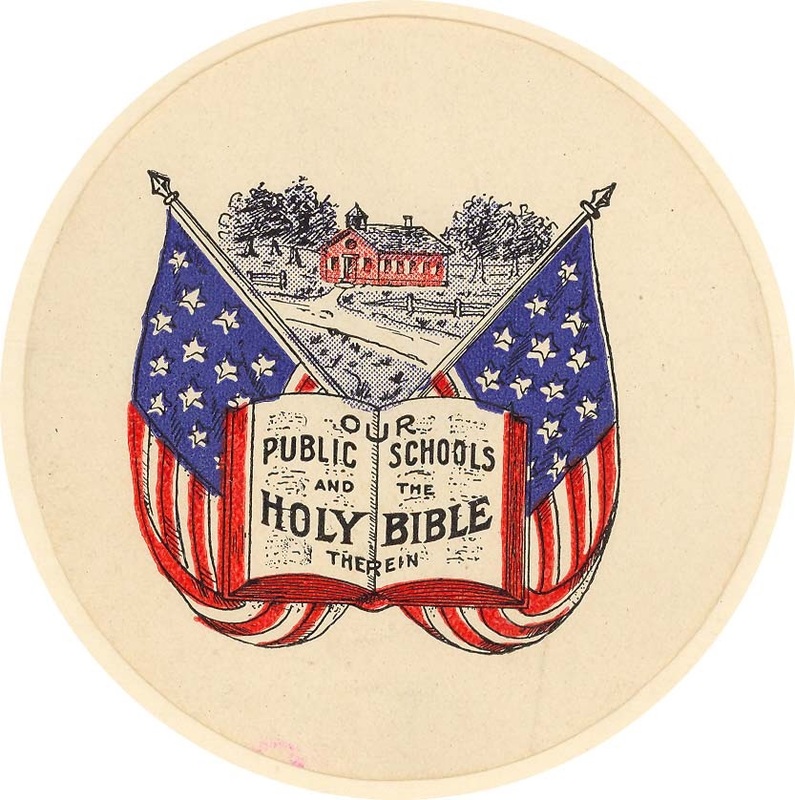 The term "Christmas seal" was used in 1905 for similar decorative labels sold in stores. 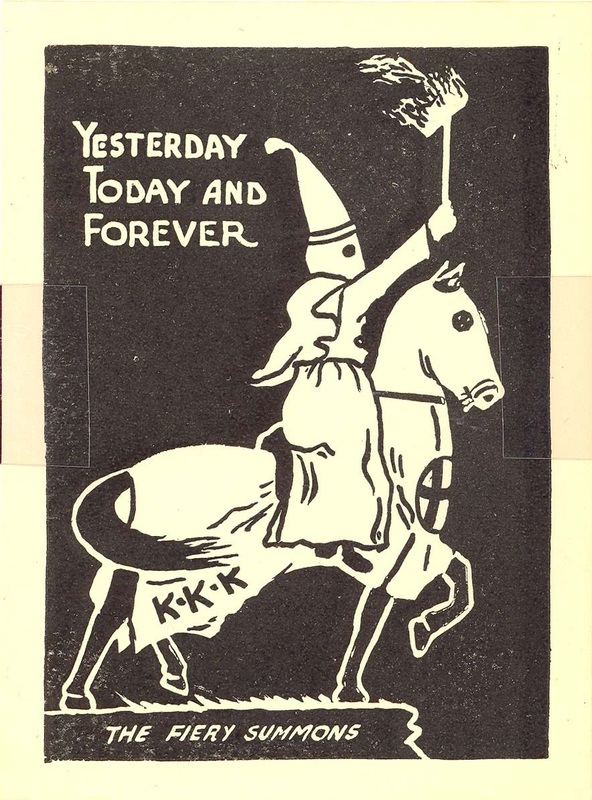 This predates the ALA's claimed use of the term beginning in 1907 for their particular charity seal. 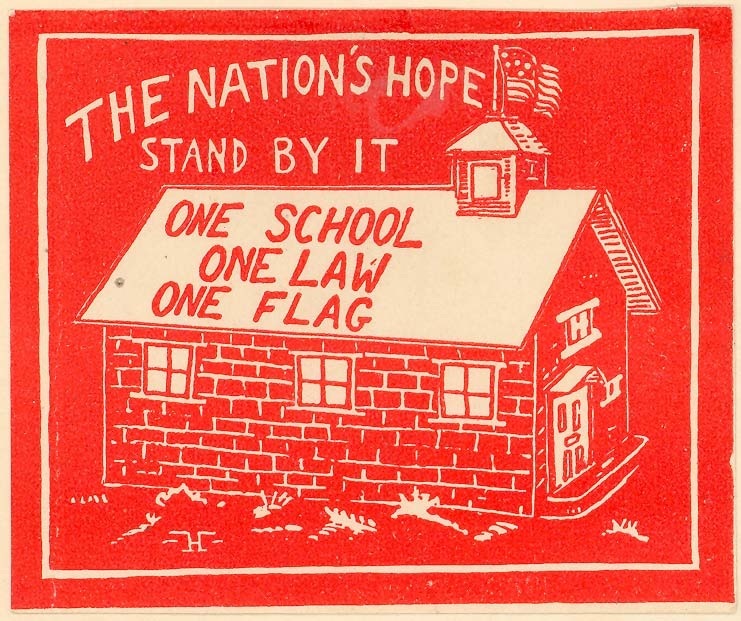 Since they didn't register the mark until 1987 and there are many other charities like Boys Town, National Wildlife Federation and Holy Childhood that mailed out their "Christmas Seals," as so identified in appeal letters or on the selvage of seals, long before then, a cancellation of their trademark could one day happen. 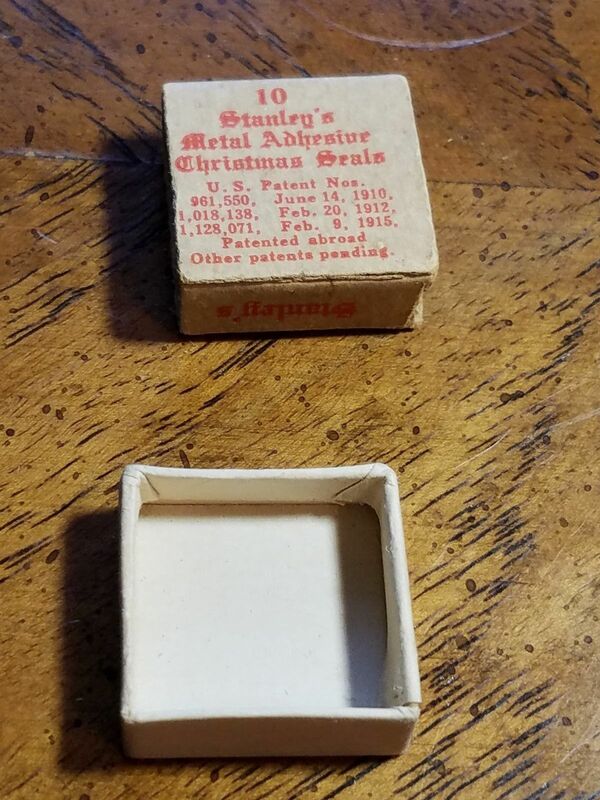 The ALA's trademark could be canceled on both grounds of generic name and their inability to prove usage of the term "Christmas seal" for charity stamps in 1907. That would be a sad day for many, however the CS&CSS wishes the ALA would relax their threats of lawsuits to collectors who refer to US local tuberculosis, and foreign TB fundraising seals issued at Christmas time, as "Christmas Seals". 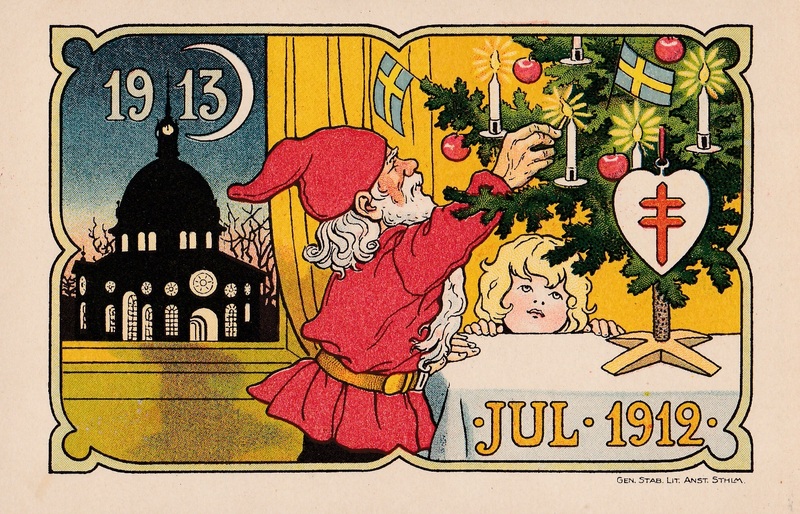 After all, Emily Bissell, designer of the first US Christmas Seal in 1907, gave credit to Denmark (1904) for conceiving the idea of a TB fundraising seal issued during the Christmas season. 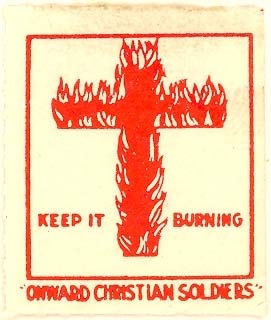 In 1919 The ALA adopted the international symbol of the fight against TB, the Cross of Lorraine, or double barred cross, used by many nations on their Christmas TB fundraising seals prior to 1919. 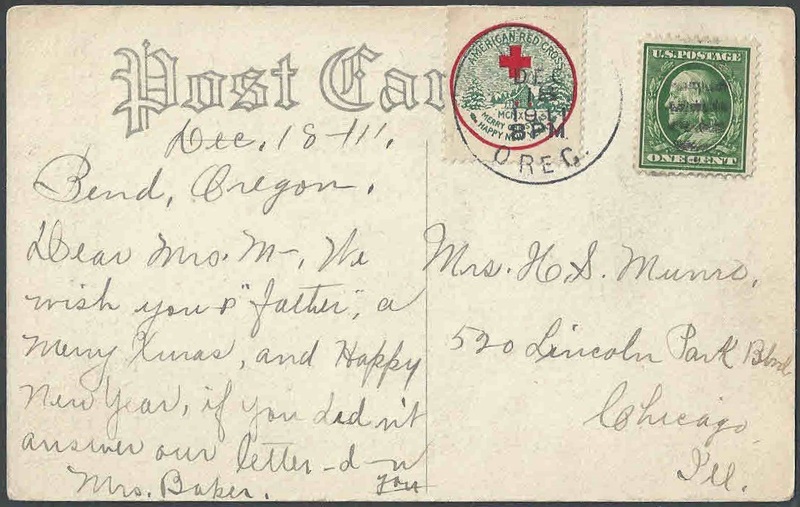 US Local #84A was issued in 1918 by the American Social Hygiene Association. 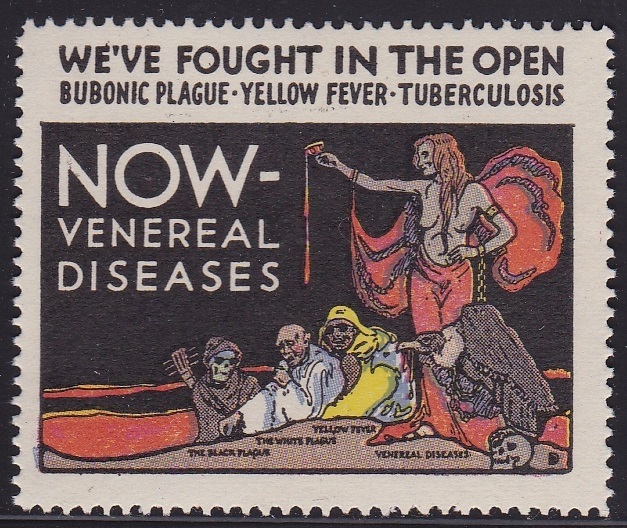 One of the more visually appealing US local anti tuberculosis seals, this association was not afraid to tackle venereal disease. 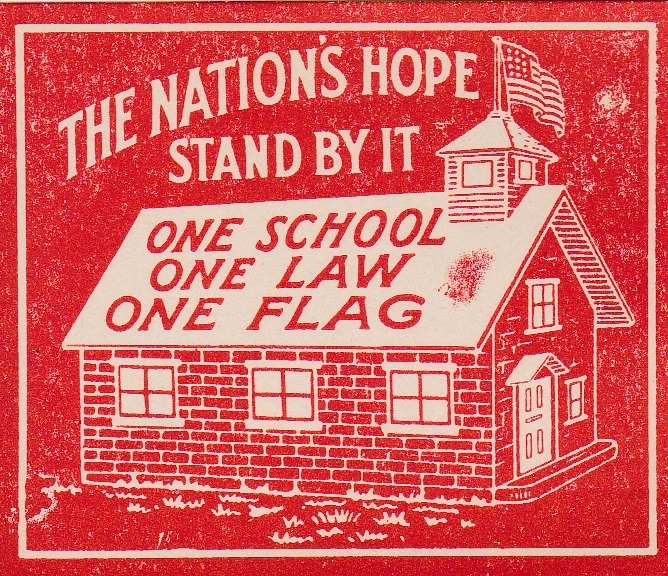 It is not known if this society issued a poster of the same design, or if this was merely the work of a producer who stumbled on the intriguing design and interesting subject matter, photo shopping the seal into a poster, but if you watch episode 7 "Home" of season 1, you will see the poster hanging on the wall of a doctor's office. HBO Boardwalk Empire, 2010-14 is R rated and the story of gangsters and crooked politicians, loosely based in fact, emerging in 1920 at the beginning of prohibition. The series stars Steve Buscemi playing Enoch "Nucky" Thompson, fictional 1920's Treasurer of Atlantic City, NJ. 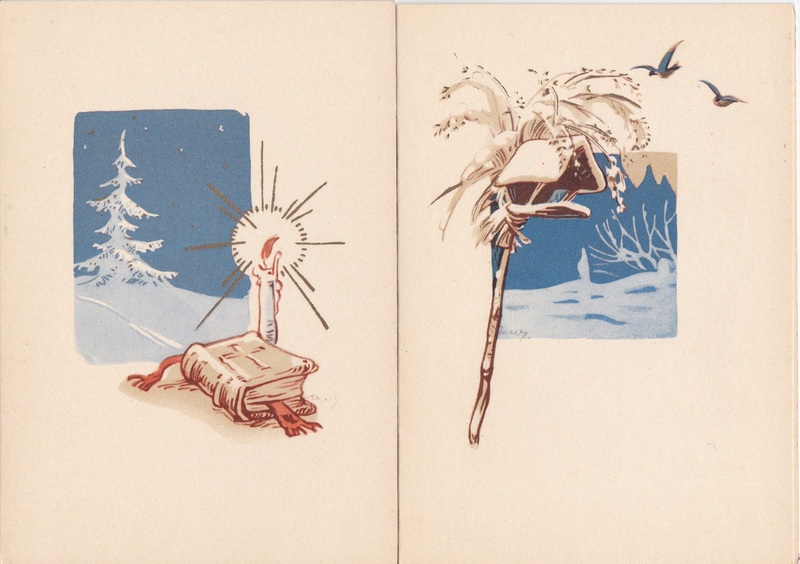 Many countries issued anti tuberculosis Christmas Seal postcards. 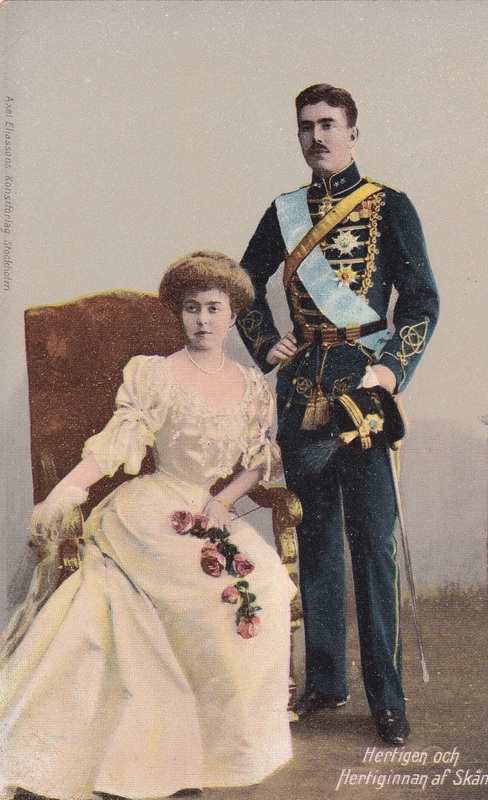 Though they often picture a TB hospital, or sanatorium, many early ones from Sweden picture the Royal family. 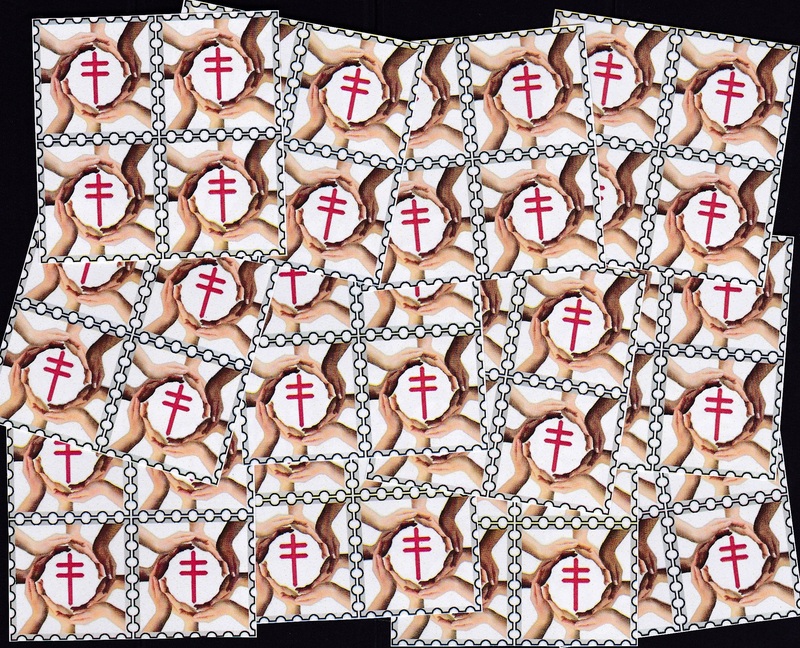 Several feature an enlarged Christmas Seal design. 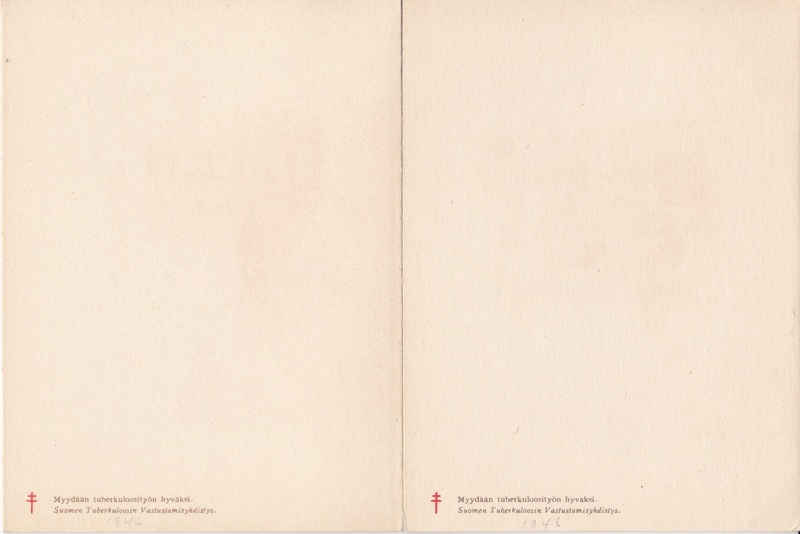 Some are difficult to identify as TB unless you study the back of the postcard. 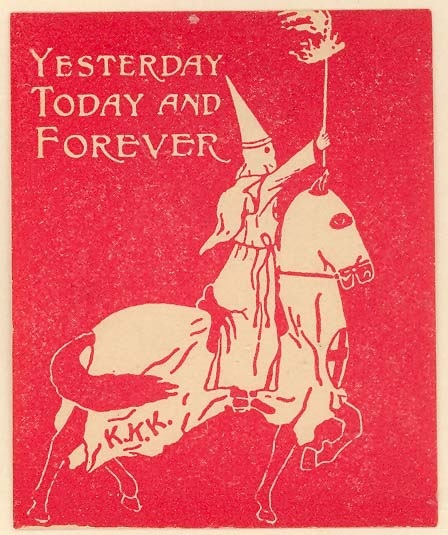 The Seals of the KKK are listed in 1966 edition of the Mosbaugh All Fund Catalog, Civic and Fraternal section. 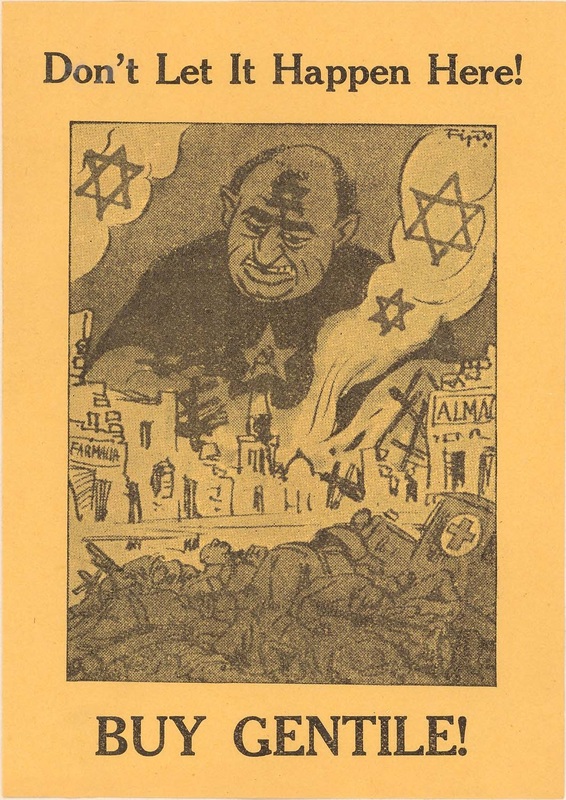 The reason they were removed is a mystery; perhaps they were considered too evil by the editor, Ray Mosbaugh. 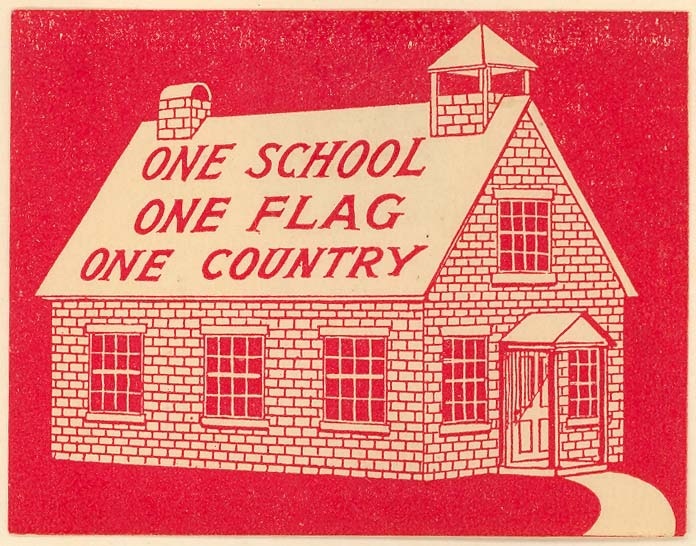 Several hide behind patriotic themes; others have more direct messages. 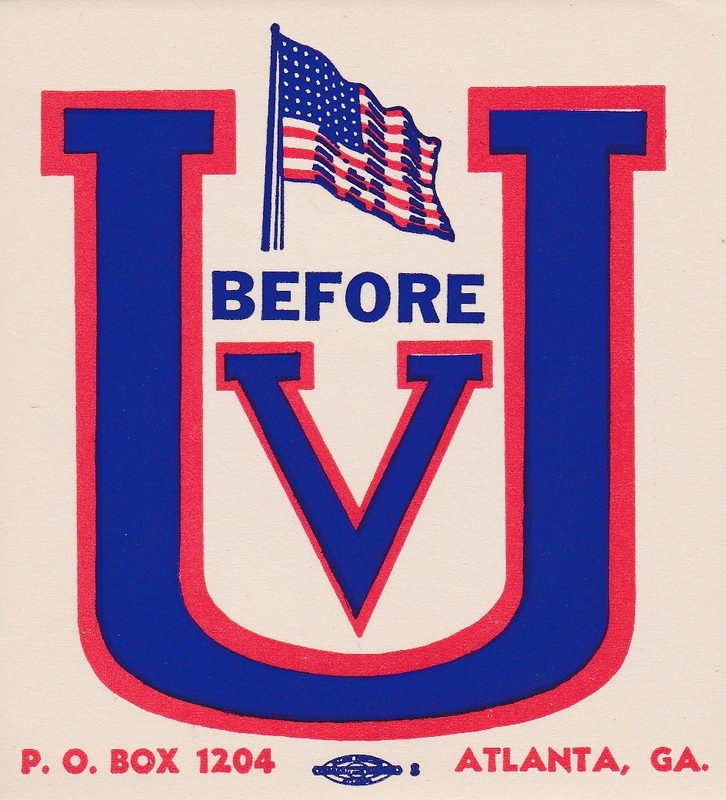 The "U before V" window label at first glance appears to be a WW2 patriotic label, but was issued by the KKK. 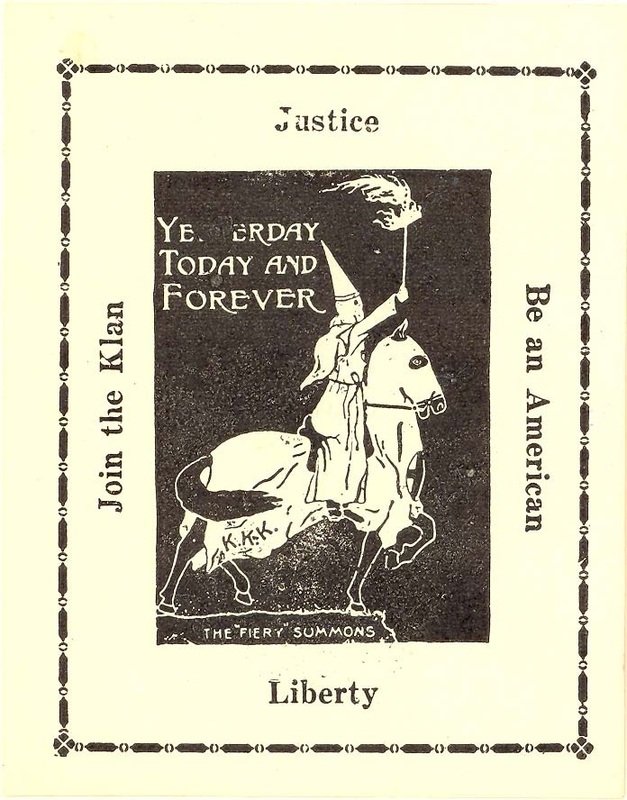 Below is an old article about this seemingly patriotic label, where noted author of his day, Frank Colby supports ideas put forth by the supreme Klan leader, the Imperial Wizard. 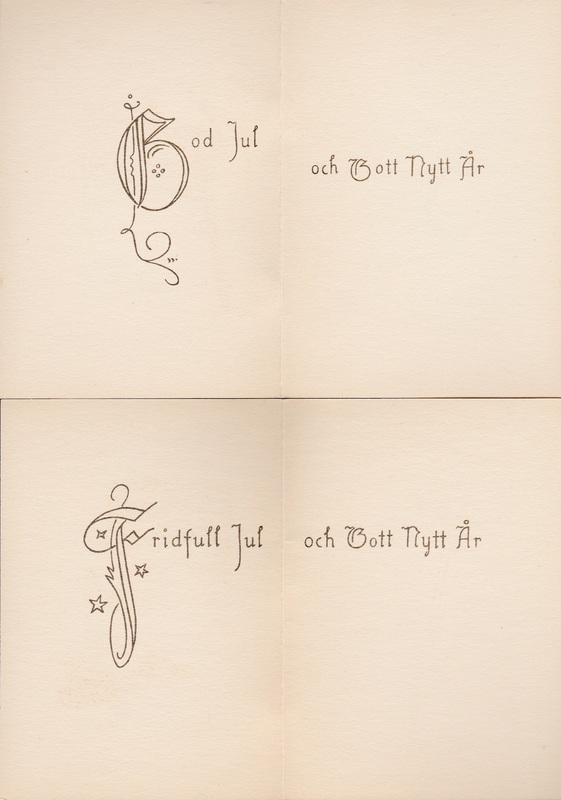 TB Seals issued during the Christmas season are well cataloged, but many "Back of the Book" related items are not. 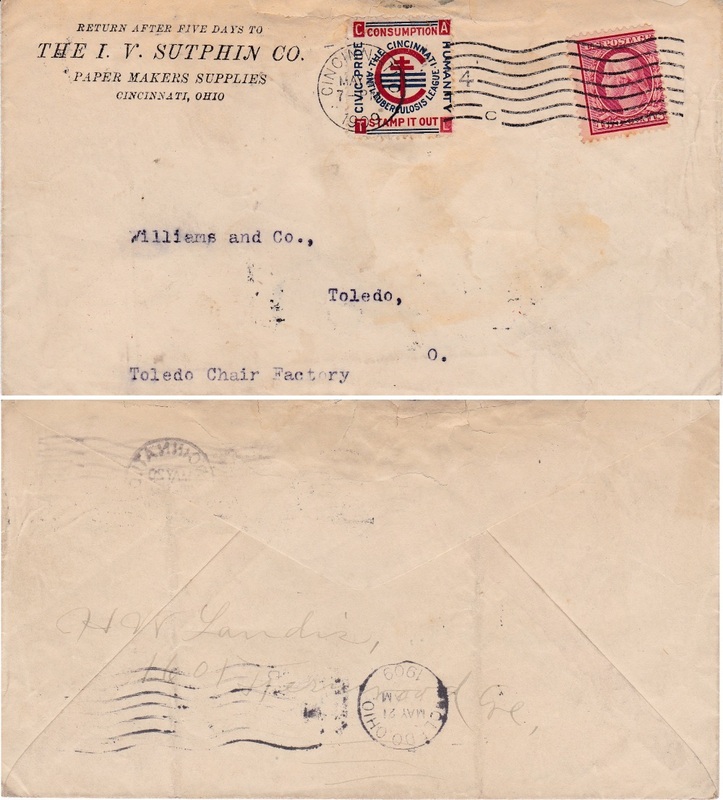 Related material used in Christmas Seal campaigns includes bonds, buttons, coffee mugs, lantern slides, ladies scarfs, letterheads, milk bottle caps & collars, package inserts, pamphlets, posters, transit passes, etc. 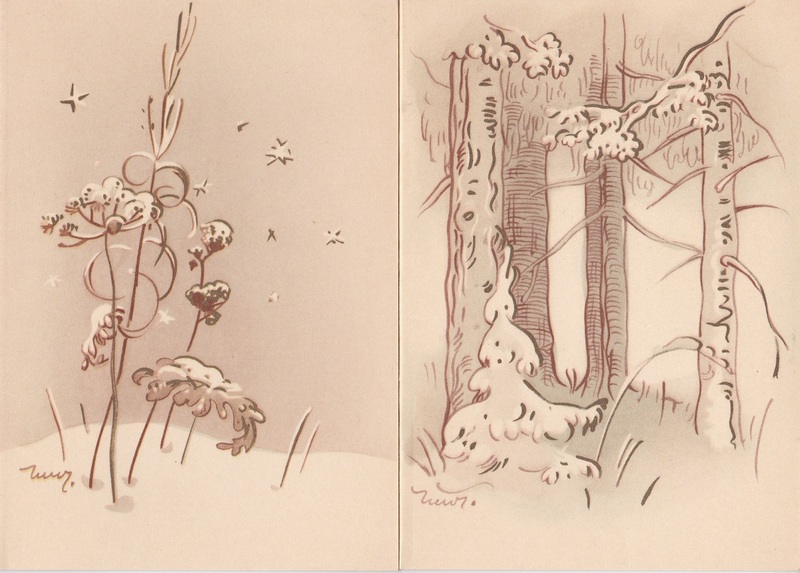 These Finnish Christmas Cards were created by their National TB Association in 1946, 1952 and 1954, as well as two later ones unidentified by year. 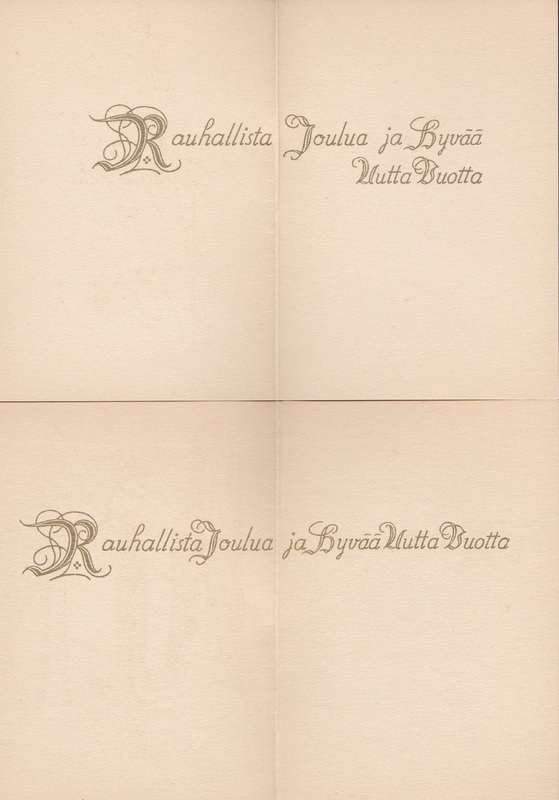 The entire collection of 19 different cards is viewable in the pdf file, below. This unique collection was shipped to Europe in 2016, and lost in the mail. Since 1980 US Christmas Seal designs have been selected from a previous years design experiment, with one notable difference being the date. James Hale, Christmas Seal collector and National Director of the Christmas Seal Campaign from 1979 to 1985, submitted this image after I told him it was unlisted in Green's Catalog. 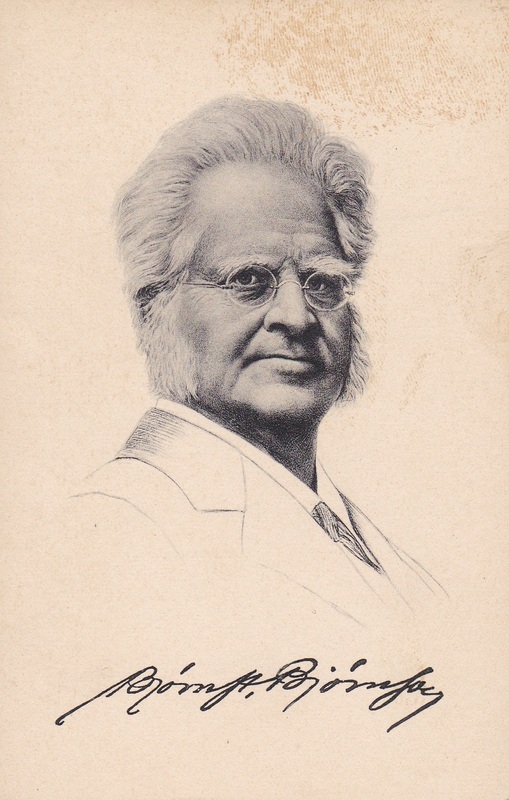 The William Vanderdasson design experiment is a modern raritity. 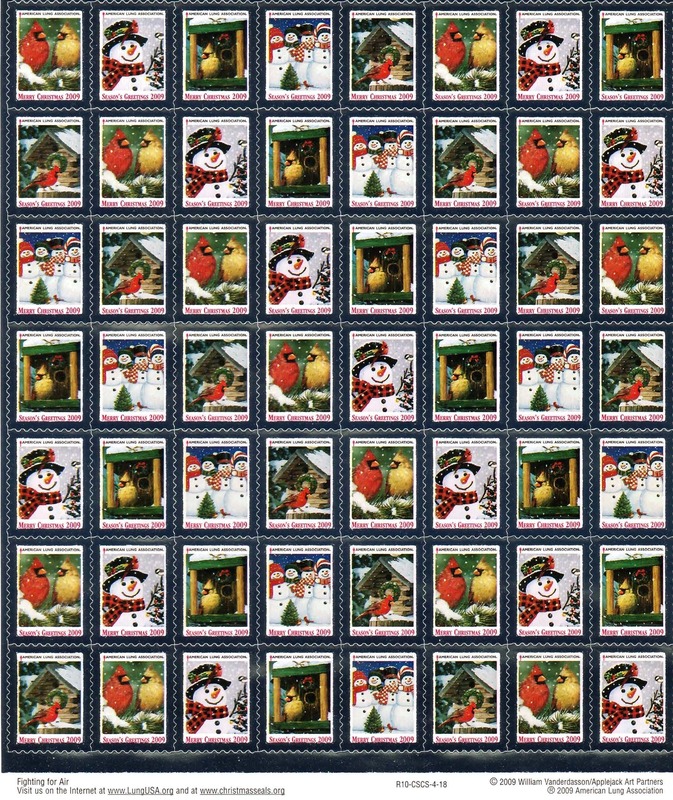 2009-T7 Cardinals & Snowmen, Silver foil border, 5 different designs each with “Merry Christmas 2009” or “Season’s Greetings 2009”, self adhesive, serpentine die cut. 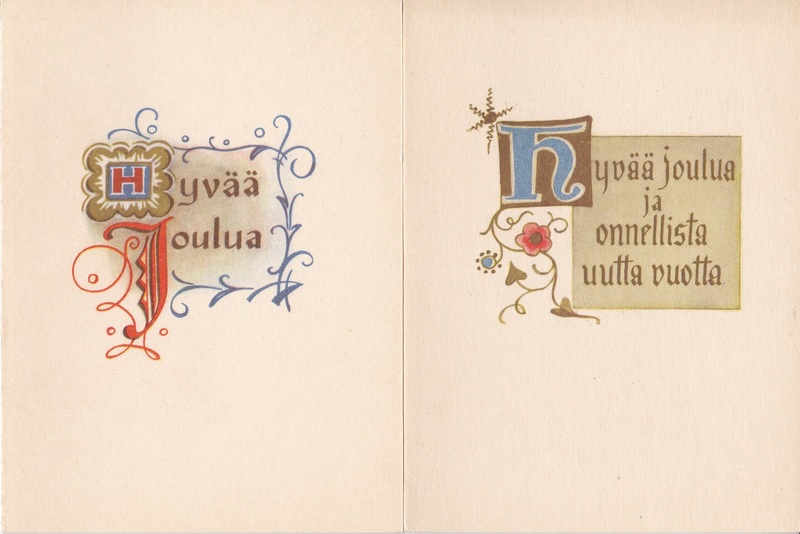 Designed by William Vanderdasson. x1) sheet of 56 without gift tags (8x7), margin on 4 sides. “R10-CSCS-4-18” in bottom margin.